On the occasion of artist and composer John Wiese's 100th 7-inch record release, Family hosts a sound installation and retrospective exhibit. 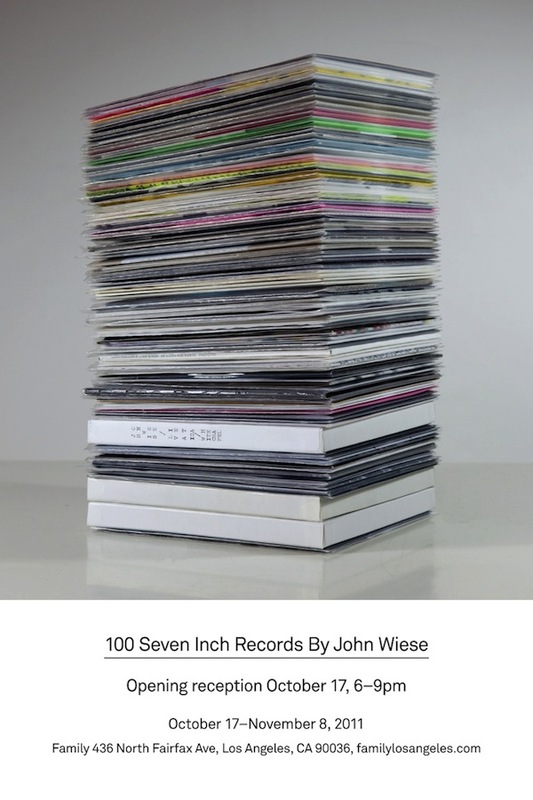 All 7-inches produced by Wiese over the last 13 years are presented, in addition to a sound piece featuring the 100th, entitled Exhausted Spectral Incantation - a one-sided record, featuring a single lock-groove. Many releases were published on Wiese's own label, Helicopter, as well as over 50 other independent labels from around the world, in editions from 6 to several thousand. To coincide with the exhibition a hardcover monograph (b/w, 150 pages) will be published by Helicopter featuring essay's by Sam McKinlay and Brian Roettinger. John Wiese (b. 1977) is an artist and composer living in Los Angeles, California. He works primarily in recorded and performed sound with a focus on installation and multi-channel diffusions, as well as scoring for large ensembles. He has toured extensively throughout the world, covering the US, UK, Europe, Scandinavia, Japan, Australia, and New Zealand. He is also a founding member of the concrète grindcore band Sissy Spacek.